Butterfly weed will of course attract butterflies, but is also deer resistant. If started in pots early indoors, it may bloom in late summer the first year. Mark its spot for it is late to emerge in spring and the taproots do not like disturbance. 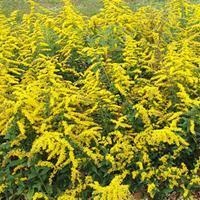 Makes an outstanding addition to wildflower gardens and edges of sunny borders. A top beneficial insect attracting species, nurturing many species of helpful bugs. Watering Details: These plants prefer drier soil, and can tolerate drought—they are often used in xeriscapes. About an inch of water per week while establishing is plenty, so don't fret if you don't get around to it right on time. Fertilizer: Butterfly weed is not a heavy feeder, so a single application of slow-release , organically-sourced fertilizer in springtime is sufficient. Or, provide with a thin layer of compost each spring—scratch in. 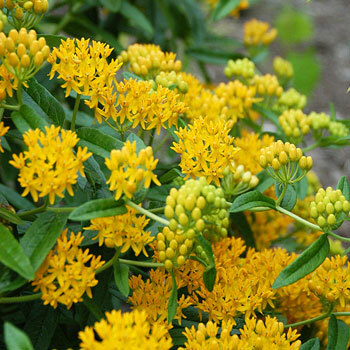 Diseases & Pests: Butterfly weed can occasionally be susceptible to rust, especially in the southeast, but this can be avoided by preventively spraying with an organic fungicide every two weeks or so, depending on local weather conditions. Plant: Hairy stems with deep green lance-shaped leaves arise from the ground much later than most other perennials—take care when digging in your garden in springtime, as they may not yet be visible. 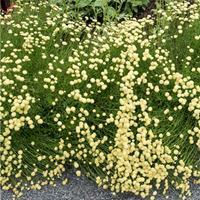 Flowering: Dense, flattened clusters of tiny sunshine yellow flowers are presented on the stems and make great cut flowers. If removed when still green, they can be used in dried flower arrangements. Remove spent flowers to prevent any unwanted seedlings. 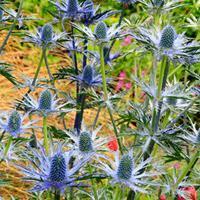 Seeds: Flowers will turn into conspicuous, oblong seed pods 3-6" in length. The pods are great for dried flower arrangements if collected before they open, and contain many silky-tailed brown, flat seeds which are spread by wind. Be sure to remove seed pods if you do not want them to self-sow. When to Cut: Dried: before buds open, for fresh, 1/2 open, or after seed pods have started to dry. Butterfly weed roots were used to treat a variety of ailments in the past, including pleurisy, bronchitis and other pulmonary disorders.